There is a controversy to how safe Lobelia is. Of the several beautiful varieties of this plant, Lobelia inflata is the one that has the medicinal values I will talk about today. Other common names for this herb are pukeweed and Indian tobacco. There are good reasons for this, which will be discussed here. 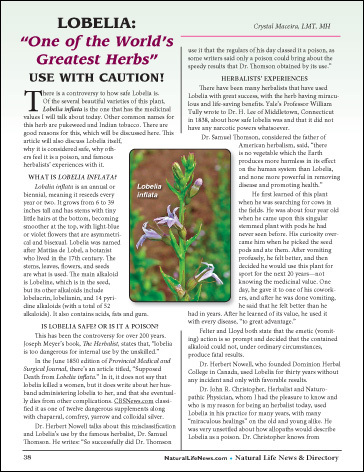 This article will also discuss Lobelia itself, why it is considered safe, why others feel it is a poison, and famous herbalists’ experiences with it. What Lobelia inflata? It is an annual or biennial, meaning it reseeds every year or two. It grows from 6 to 39 inches tall and has stems with tiny little hairs at the bottom, becoming smoother at the top, with light-blue or violet flowers that are asymmetrical and bisexual. Lobelia was named after Mattias de Lobel, a botanist who lived in the 17th century. The stems, leaves, flowers, and seeds are what is used. The main alkaloid is Lobeline, which is in the seed, but its other alkaloids include lobelacrin, lobelianin, and 14 pyridine alkaloids (with a total of 52 alkaloids). It also contains acids, fats and gum.